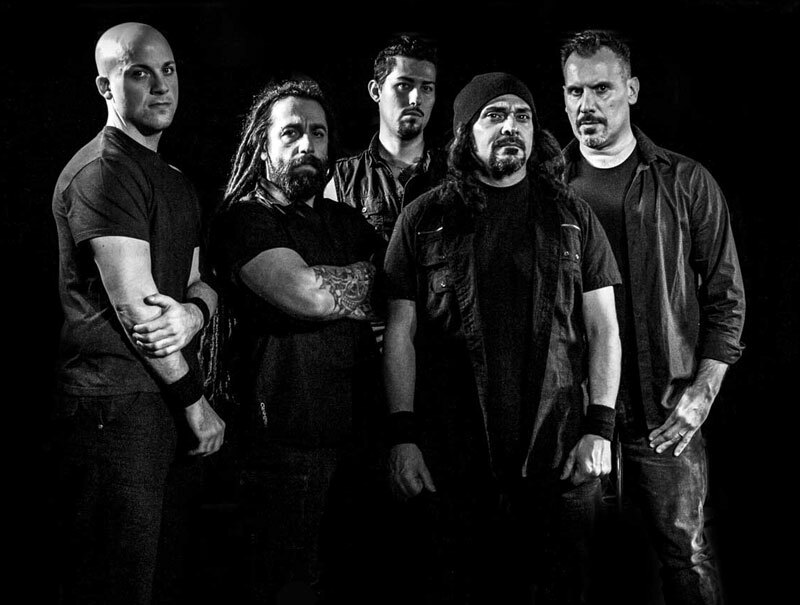 Italy, anno 1991: influenced by bands such as QUEENSRYCHE, ANNIHILATOR, CORONER and FATES WARNING, the ex-Zeus musicians Terence Holler (vocals), Eugene Simone (songwriting, guitar) and Adriano Dal Canto (drums) form the band ELDRITCH. Following very positive media echoes to their first demo tape, the lads, having been joined in the meantime by Martin Kyhn on bass and Oleg Smirnoff on keyboards, sign an agreement in 1993 with Limb Schnoor as Manager and music publisher. OldTheir debut CD, “Seeds of Rage”, released in 1995 by INSIDE OUT MUSIC is promptly named Album Of The Month in the popular German “Heavy, Oder Was? !” magazine. That was of course an exceptional success for an Italian band in those days. This extremely successful debut was followed in 1997 by “Headquake”, which, besides reaping excellent reviews internationally, was also the starting shot for a huge, world-wide community of fans. The supporting tour with ANGRA also ensured steadily increasing record sales. ELDRITCH ended this unusually successful season with a show in front of over 10,000 fans at the famous Gods Of Metal Festival in Milan. el ninoWith their next album, “El Nino”, released in November 1998, ELDRITCH showed themselves from a more versatile side and worked harder on harder, more thrashy passages, which clearly reflected their innate influences of METALLICA, CORONER and ANNIHILATOR. Showered by praise and excellent reviews, the band reached the highest point of their career at that time. This was followed by well-visited concert tours with THRESHOLD and PAIN OF SALVATION, after which ELDRITCH was viewed as a trendsetter in the international Prog Metal scene. With Sean Henderson on keyboards, the young, wild talent Dave Simeone on drums and a new deal with PICK UP/METAL BLADE RECORDS in their pockets, they released an even harder and more experimental album, Reverse2″Reverse”, on which one recognised influences of more modern bands such as PANTERA and MACHINE HEAD. Critics were silenced by the album’s excellent sales figures and a triumphant return to the legendary Gods Of Metal Festival, all of which showed the band’s creativity due reward. After strengthening the line-up with the addition of rhythm guitarist Rob “Peck” Proietti” , ELDRITCH produced three video clips, amongst others a cover version of THE KNACK’s super hit “My Sharona” and were soon able to look back upon the most successful year of the band’s first decade. During the next three years ELDRITCH prepared themselves for the leap into the next league. It was again time for change. Keyboarder Sean Henderson and bass player Martin Kyhn left the band for personal reasons and the remaining members decided to bring a woman bass player into the band, in the form of Icycore’s Lisa Oliviero and to do without keyboards for the moment. The Italians signed a new deal with Limb Music Products and, in 2004, released “Portrait Of The Abyss Within”, on which they succeeded in portraying all the various stages of the band’s creativity and history, and one which was enthusiastically welcomed by fans and the press alike. Before setting off on an extended Italian tour, John Crystal replaced bass player Lisa Oliviero, because of conflicts in the calenders of Eldritch and her other band, Icycore. Abyss3In the year 2006 ELDRITCH are in the best form of their lives and this is underlined by their brand new album, “Neighbourhell”. Once again they present a mixture of aggressive and progressive parts, comprising genuine killer riffs and unforgettable melodies, allowing tracks such as ‘Still Screaming’, ‘Bless Me Now’ and ‘Come To Life’ to become compact, timeless masterpieces of metal. In addition, ‘Save Me’ is a genuine superhit and with FAITH NO MORE’S ‘From Out Of Nowhere’ they also have a fabulous, originally arranged cover song. Nobody will be able to turn their back on an album like “Neighbourhell” with its fabulously played, atmospheric Heavy Metal way beyond all clichées and trends. Black2And the two additional bonus tracks plus the video clip to ‘Save Me’ make this limited edition digipak to a must-have dessert for the gourmets of heavy metal! In the year 2007 the band recorded the 7th album “Blackenday” in a particular dark mood. The 15 songs are extremely catchy and the music is still aggressive as the previous work. Songs like “The Blackened Day”, “The Deep Sleep”, “Silent Flame”, “Hold On” and many others, will stick in your heads like never!! On the ballad “Broken Road” there are 2 special guest musicians such as : RAY ALDER (Redemption, Fates Warning, Engine) and NICHOLAS VAN DYK (Redemption) that gave their special touch to the song. There’s also a great videoclip for the “The Blackened Day” done by the director Mirco Andreis (Italy). The artwork is done by NERVE design (Italy). What else? Just one thing, Eldritch’s music is quite unique and hard to describe, but one thing is sure: it’s Melodic/Hard/Heavy/Thrash metal!! During summer 2007, after the Gods of Metal and the Sweden Rock fests, the band decided to replace the drummer Dave Simeone with the young and explosive Raffahell Dridge. This due to personal reasons between the band and Dave, but in a friendly way. In November 2008 the band finally released their first official live (in this case a double live album plus a dvd of the entire 2 hour show and some raritees). Another European tour as openers for the greek metal gods Firewind from November 2008 to January 2009 and then other shows in Italy till the end of the year… another bit of Italian headliner shows during the whole 2010 and then the band entered the recording studios. The band is now ready to record the 8th studio album “Gaia’s Legacy” and is going back to the sound of the first era, that means ultra progressive, technical, thrashy metal with keys and pianos. The lyrics are a concept about global warming effects, climate change and whatever has to do with Mother Nature and our planet. There’s a new second guitar player that replaced Pek Proietti, his name is Rudj Ginanneschi, a real axe killer!! The new official keyboard player is Gabriele Caselli (ex Domine), which is giving the new album a really progressive and modern touch! Eldritch are officially confirmed for Atlanta’s PROGPOWER U.S.A. fest on September 2011, not bad at all! Now, after a few headlining shows in their home country during the last 2 years, the band put their effort in this new fresh album “Tasting The Tears” which will be released on February 17th in Europe and 18th 2014 in the U.S.A. and remaining territories. The reviews so far confirmed that it’s a real masterpiece!! The band replaced the bass player John Crystal (after 10 years) with the new talented Alessio Consani and right-after decided to go on without the keyboard player/pianist Gabriele Caselli, using the keyboards only in the studio (played by Eugene Simone) without replacing him on stage. The band now is a 5-piece. During Spring/Summer of 2015 the band recorded the 10th studio album (using the same team as the previous one) titled “Underlying Issues” out worldwide on November. The reviews so far are more than amazing!! This new album is another step forward in the band’s songwriting … Catchy as hell but still technical and progressive as the second single and videoclip “The Face I Wear” shows! The most important live gigs of the Underlying Issues promotion were in March 2017 when the band plays two shows as special guests for Russell Allen’s Metal for autism tour. In October 2017 the band starts the recording sessions of their 11th studio album. These new tracks are very well arranged and they got an intense and full sound. So the band asks Gabriele Caselli to get back as a session man and increase the level. As expected he does a great job and in a few months, in march 2018, ‘Cracksleep’ takes its form and out worldwide via Scarlet Records! In a couple of weeks it gets amazing reviews and the band releases two singles: the lyric video ‘As The Night Crawls In’ and the videoclip of the opening track ‘Reset’.